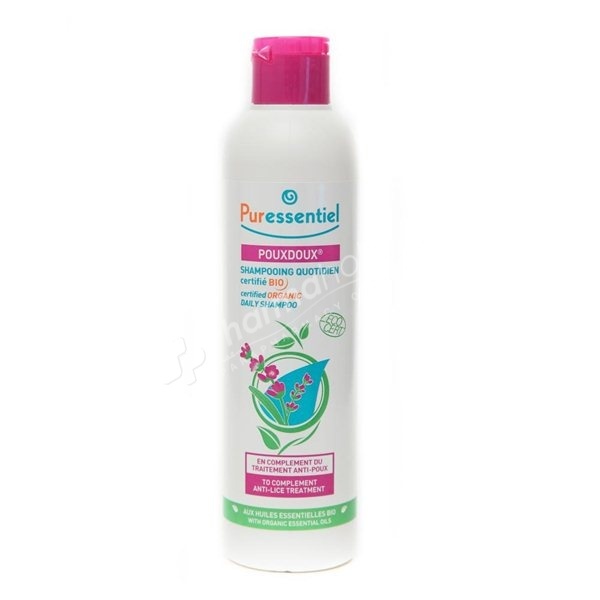 In addition to the Anti-lice lotion Puressentiel: Pouxdoux shampoo, essential organic lavender, lavender, ylang-ylang and geranium oils, is used to cleanse the scalp and help loosen the nits and lice dead. Essential Oils of Lavender, Tea Tree, Geranium, Rosemary, Lavender, Clove and repulsive to the soothing scalp. Apple vinegar to the revitalizing properties of the hair fiber. In everyday use: to ensure protection and natural health of the entire family. Apply to wet hair, lather and rinse thoroughly with water. Avoid contact with eyes. In case of contact with eyes, rinse with plenty of water. Not recommended for children under 3 years old, pregnant or nursing women. External use.